Live Dulcima peformance combined with a whimsical and beautiful 1926 Animation, a wonderful evening spent at the De la Warr Pavillion last Frida. . The Adventures of Prince Achmed was the first feature length animation film in the history of the cinema. It is a ‘silhouette film’. Lotte Reiniger (1899-1981) was the inventor of this genre. Work on The Adventures of Prince Achmed began in 1923. It was released in 1926. This wonderful animation film is full of adventure, lyrical sensuality, magic and romance, playful humour, strong female characters, exciting bat- tles and sinister evil. The story was inspired by elements taken from the Tale of the 1001 Arabian Nights. The Adventures of Prince Achmed is one of those rare and timeless films that appeal across the complete age range. The beauty and intricate detail of Reiniger’s exquisite filigree artwork is of the highest quality. She was inspired by Chinese and Indonesian shadow plays and adapted this ancient art for the cinema. The distinctive combination of silhouette characters, colour tinted landscapes and backgrounds is unique and profoundly evocative and seductive. Moreover, the use of silhouette characters leaves the imagination free to soar in response to the sensuality and magic of the story. We are treated to a splendid cast: Prince Achmed, Princess Peri Banu, the Witch of the Fiery Mountain, the Evil Sorcerer, The Magic Horse, Aladdin,xPrincess Dinarzade and The Caliph. The fact that all the characters are silhouettes is fundamental to the essence and power of the film. 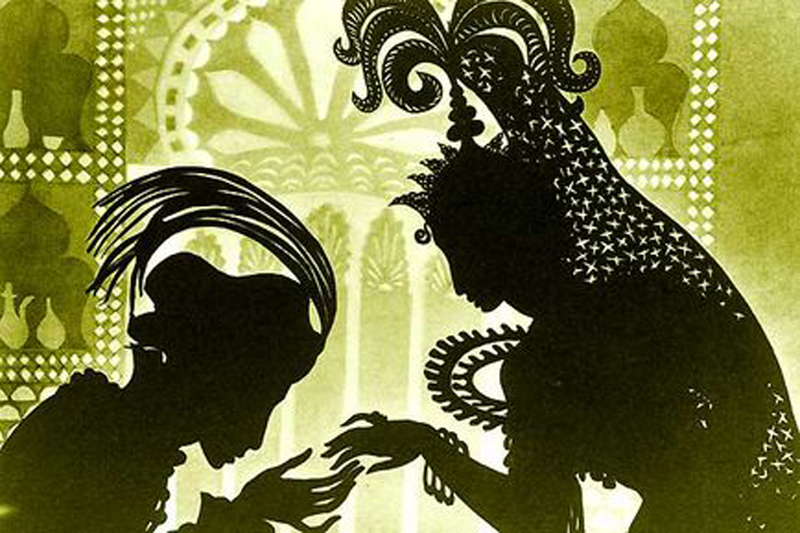 The Adventures of Prince Achmed is a captivat ing and beautiful work of art. It is a magnificent example of stop frame animation and consists of three hundred thousand separate frames. It is undoubtedly one of the shining gems in the history of cinema and is widely acknowledged as a masterpiece. It is the ‘haute couture’ of animation. Lotte Reiniger was a pioneer who dedicated her life to creating silhouettes. She made more than eighty animation films. The original prints of The Adventures of Prince Achmed featured colour-tinted backgrounds. Working from surviving nitrate prints, German and British archivists restored the film and managed to incorporate the original tinted backgrounds, which in their dynamic interaction with the silhouette characters are crucial to the aesthetic of the film. Prints available just prior to the restoration had only been in black and white. Geoff Smith’s new score for The Adventures of Prince Achmed has been inspired and led by Lotte Reiniger’s genius. He has attempted to do justice to her achievement. For the performance of the soundtrack Geoff uses numerous prototype Hammered dulcimers, one being the first ‘Fluid dulcimer’ incorporating his revolutionary ‘microtonal fluid tuning mechanism’ patent, without which it would have been impossible to compose and perform the soundtrack. For further information regarding this invention and some of its historic implications please refer to the Guardian newspa- per article ‘Composer reinvents the piano’. Geoff Smith’s pioneering score for The Adventures of Prince Achmed is a revelation in the composition and performance of live music for animation. He has dedicated himself to exploring the wider spectrum of musical choices that his invention offers, so that in the composition of the score it has been possible to respond in more intimate, expressive and expanded detail to this unique and uplifting film. His immensely dynamic score illuminates and emphasises Lotte Reiniger’s aesthetic obsession, consummate artistry and passionate commitment to story telling. This is fascinating… have to admit I’d never heard of the movie until now. Thanks so much for the introduction. Your work is exceptional too… just enjoyed looking at your flickr pics. The first feature length animation film in the history of the cinema was “El Apóstol” (1917), directed by Quirino Cristiani. He was also an innovator in the cut-out animation technique. Having said that, yes, The Adventures of Prince Achmed is one of the most beautiful animations ever made.